The language of the 2016 Presidential election cycle insulted, demonized, and threatened many of us — immigrants of all statuses, Muslims and those of diverse religious faiths, people who identify as LGBTQIA, Native people, Black and Brown people, people with disabilities, survivors of sexual assault — and our communities were hurting and scared. We were confronted with the question of how to move forward in the face of national and international concern and fear. In November of 2016, 43 women gathered in a library in the suburbs of the Twin Cities. Hardly anyone considered themselves an activist; certainly no one had ever planned or organized a large-scale protest march. Still, we wanted to send a bold message to the administration on their first day in office, and to the world that women’s rights are human rights. We had only eight weeks to make it happen. We held meetings, and our numbers grew. Members of newly-formed committees sent emails before work or late at night, or when the kids were asleep, or whenever we had a spare moment. We applied for permits, figured out porta-potties, and starting asking people to volunteer as march marshals. We discussed t-shirts, and fundraising, and getting the word out to all the corners of Minnesota. We were hearing that as many as 30,000 people might show up. More than three times that number did. 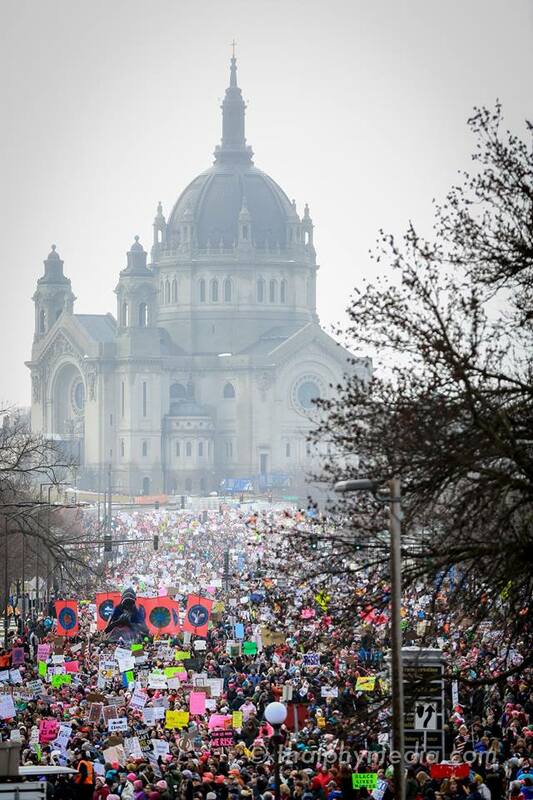 January 21st 2017 became on of the largest rallies in Minnesota history as 110,000 of our brothers, sisters and gender non-identifying siblings showed up. That day, the message could not have been clearer: we are better together. No one who was there will ever forget the waves of people walking from all directions towards the Capitol, the packed light rail trains and traffic stretching out for miles and miles. 110,000 people chanted, held signs, listened to powerful speeches and musicians that shared messages about defending human rights, that positive change is possible and that our country can and must move forward instead of backward. That day we became the largest single day protest in history as over 5 Million people marched around the world, on all 7 continents. But it didn’t end there, because in Minnesota, we have moved from a moment to a movement! Our mission is to harness the power of women and their communities to create transformative social change, and our work is to Educate, Amplify and Activate. We believe this can be accomplished by focusing on our Unity Principles in the work toward equity, equality and justice: Ending Violence, Reproductive Rights, LGBTQIA+ Rights, Workers’ Rights, Civil Rights, Rights for People with Disabilities, Immigrant and Refugee Rights, and Environmental Justice. We recognize that defending the most marginalized among us is defending all of us. We support the advocacy and resistance movements that reflect our multiple and intersecting identities. We will not rest until women have parity and equity at all levels of leadership in society. We work peacefully while recognizing there is no true peace without justice and equity for all. 66: The total number of women holding seats in the Minnesota legislature. 201: The number of seats. California, Florida, Georgia, Kentucky, Massachusetts, Missouri, New Jersey, Tennessee, and Texas. The fight for equity, equality, and justice resides in all communities. Women's March Minnesota is committed to ensuring that the voices of women from all backgrounds and identities are heard. We seek to forge new alliances that will enable us to work together for equal justice in the months and years ahead. Some folks may say this dream is impossible, but if the one thing we know about women in Minnesota is: we get s**t done. We know that women’s marchers like to come together - to be inspired, learn, and to see and support strong, powerful women in action. We know that we have a community that supports the work of women of color and indigenous women who have been doing this work for a very long time. We also know that part of our work is to activate and broaden the traditional messaging that many of us have received. WE COMMIT to work together with our allies, who have been in this fight far longer than we have. We acknowledge their history, struggles and accomplishments. We assist where we can; and show up to support them in their continued fight for justice for all. WE MARCH — and continue to carry our movement forward — because policies are more than politics and affect our everyday lives. More than that, civic engagement and speaking truth to power provide the foundation of our democratic political system and society. We aim to uphold our constitution and the rights it enshrines! We believe that you cannot stand for freedom for one group and deny it to others. Personal prejudice and systemic discrimination are pervasive in America and lead to the marginalization of many people, including women, people of color, American Indian and Alaskan Natives, LGBTQIA individuals, immigrants, religious minorities and people with disabilities. We march for the rights of marginalized communities, for just and equitable systems, and for the freedom of all peoples who make up our diverse nation. We know that Minnesota is not immune from discrimination or disparities and vow to work toward more inclusive, equitable communities. Do it Now. Get Involved.